Some meetings are the best in an exclusive environment, without other conference guests or distracting surroundings. 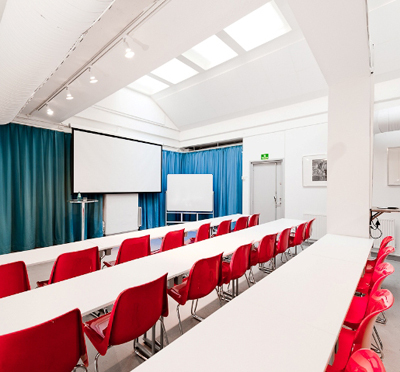 At Kungsvalvet Konferens in Kungsholmen, in central Stockholm, your company meets in exclusivity with the entire facility yourself. A modern and bright meeting room with lounge and other areas for smaller discussions or a coffee break after an intense session. Kungsvalvet is suitable for up to 90 people in cinema seating. It is a bright and modern meeting room. Refurbish, furnish right: the red chairs can be moved and adapted to the purpose of the meeting and choose if you need tables or not - all 150 square meters are at your disposition! A separate area for about 20 people is also available at the facility. The conference lunch is served at Kungsvalvet and provides a pleasant break from hard work. We can seat by long tables or make use of the cozy sofas for the coffee break and meals and let the break be a battery recharger for future meetings! Combine Conference with an Activity! At Kungsvalvet Konferens you work with a whole concept - everything from coffee to activities. If you have time and opportunity, you can organize a unique and fun competition in several different ways or take your meeting group out on a Segway tour around Kungsholmen's beautiful surroundings. Many more options and opportunities are available to explore - talk to Kontur Konferens for further information! Kungsvalvet Konferens is located at Kungsholmen in Stockholm, centrally and with Riddarfjärden a few blocks away. By public transport, you will reach Stockholm’s central station in about 5 minutes - smart for both traveling and local colleagues! Have you been to Kungsvalvet and want to give your own comments?